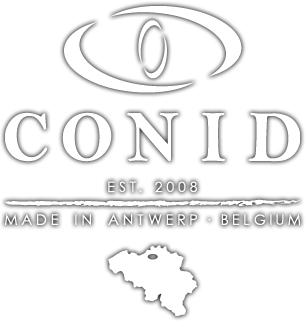 Conid opened its AntwerPPen & More exhibition with an exclusive vernissage on July 21st. More than 200 people came by to discover our collection and our brand new Cavens Pen. As you might know, we at Conid like to engage with people and let them experience what we are so passionate about. That’s why we figured out a very special way to break the ice. On the evening of the vernissage, very visitor received a personal card when entering exhibition. On this card, there was space to write your very own pangram, a sentence using every single letter of the alphabet. 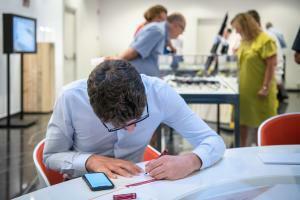 People could fill in the card with a Bulkfiller and even win a brand new vibrant red AntwerPPen. At first, people were a little unsure about what they were supposed to write, but soon they started discussing, searching inspiration and trying our Bulkfillers with fellow visitors. This resulted in a beautiful collection of unique, handwritten sentences from young, old, experienced and brand new Conid writers. Some people even took the effort to write something about Conid and our newest edition: the Cavens Pen. “He who desires an eccentric yet almost daily usable fountain pen, will choose Conid with love”. In line with the story of Jozef Cavens, we let people demonstrate the finest example of their handwriting. In that way , we also showed that although everyone is taught how to write in the same way, our handwriting is also very personal and unique. At Conid, we aim to take everyone’s unique style of writing in consideration, by grinding every single nib according to the writer’s personal preferences, for example. Engaging people to write also provided the perfect occasion to let them try out several different Bulkfillers, nibs and collections. After all, our pens are beautiful to look at, but most imporantly they are made to be used, by people who love writing.